Brahms' chamber music is among the best ever written, and these performances are among the best ever recorded. 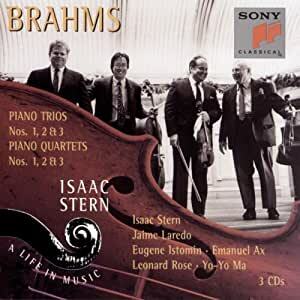 I heard the Stern Rose Istomin trio play all three Brahms piano trios in Carnegie Hall in 1967. I had heard chamber music ever since I could remember, but THIS was life changing! or prejudice towards his sentimental side. These pieces are clearly some of the finest ever played to date. Oh, yea, this is the ultimate for these works. Not surpassed as far as I can tell. 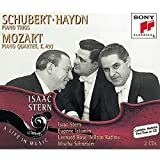 These men really love these trios and piano quartets. These CD's contain some of the best chamber music ever recorded. Each member of the ensemble seems to fit in without ever dominating. If you want to hear how chamber music should be played - get these discs!